China successfully carried out its first docking exercise today between two unmanned spacecraft, a key test of the rising power’s plans to secure a long-term manned foothold in space. The Shenzhou 8 spacecraft joined the Tiangong (Heavenly Palace) 1 module about 340 km (211 miles) above Earth, in a manoeuvre carried live on state television in the early hours of the morning. The 10.5 metre-long unmanned Tiangong, launched on September 29, is part of China’s preparations for a space laboratory at some point in the future. 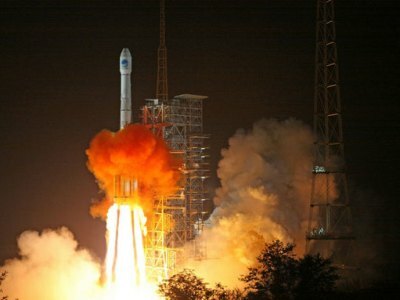 Premier Wen Jiabao and other senior leaders oversaw the operation from a command centre in Beijing, a measure of the importance the government attaches to this mission and to China’s space ambitions in general. “We believe that making this breakthrough and mastering the space docking technology is a meaningful and historic breakthrough for our country and a huge technical leap forward,” Wu Ping, spokeswoman for China’s Manned Space Engineering Programme, told a news conference. Wu said all of the components in the docking mechanism, as well as 600 onboard instruments, were designed and manufactured by Chinese firms, mostly state-owned enterprises. Rendezvous and docking exercises between the two vessels are an important aspect of China’s efforts to acquire the technological and logistical skills needed to run a full space lab that can house astronauts for long periods. The next stage will be two similar docking exercises in 2012, with at least one expected to carry astronauts. China aims to have a fully fledged space station by about 2020. The docking mission is the latest show of China’s growing prowess in space, alongside its growing military and diplomatic presence — at a time when budget restraints and shifting priorities have held back U.S. manned space launches. Beijing, however, is still far from catching up with the established space superpowers: the United States and Russia. Docking techniques such as those which China is only testing now were mastered by the United States and Russia decades ago, and the Tiangong 1 is a trial module, not the building block of a space station. Russia, the United States and other countries jointly operate the 400 tonne International Space Station, to which China does not belong. But the United States will not test a new rocket to take people into space until 2017, and Russia has said manned missions are no longer a priority. China launched its first manned space mission in 2003 when astronaut Yang Liwei orbited Earth 14 times. It launched its second moon orbiter last year after becoming only the third country to send its astronauts walking in space outside their orbiting craft in 2008. Beijing also plans an unmanned moon landing and deployment of a moon rover in 2012. Scientists have raised the possibility of sending a man to the moon after 2020.